Company Name: Sumiya Bunjiro Brewery Co., Ltd.
Our company has been brewing mirin in our factory in Mikawa, Aichi prefecture since 1910, produced traditional recipe and carefully aged for two years. We continue to produce genuine mirin over 100 years, using sticky rice, whose deliciousness is enhanced only by our own traditional brewing technique. 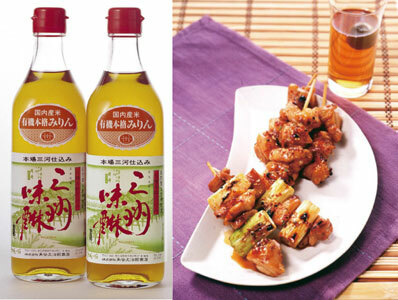 Mikawa region has rich culture and is the finest mirin in Japan. Mirin was originally brewed as a popular sweet rice wine drink 500 years ago. Mirin is the secret ingredient in Japanese cuisine, add depth and balance of flavor to teriyaki, sauces, gravies, marinades, dips and noodle broths. Mirin has produced by two manufacturing methods, a traditional manufacturing method, and an industrial manufacturing method. “Authentically Prepared Sanshu Mikawa Mirin” of Sumiya Bunjiro Brewery Co., Ltd. is made by the traditional manufacturing method. We use raw materials cultivated more naturally, and brew them in time-honored breweries to draw their natural flavors. Traditional method is a tradition of Japan. High-quality glutinous rice, a raw material, is steamed in a Japanese-style oven. Prepared unrefined mirin is saccharified and matured for a long time. This is the original manufacturing method for mirin using spirit made by simple distillation process (rice spirit). It takes two years to complete brewing and maturing. Sanshu Mikawa Mirin is authentic mirin with the good taste of glutinous rice extracted only by “brewing,” a traditional technique from ancient Japan. This mirin is so tasty that you may want to drink it. It is featured by chic and sharp sweetness and good luster and gloss. Moreover, it is full of deliciousness and richness that set off the natural flavor of the cooking ingredients. From organic rice domestically cultivated in the natural ecosystem, Organic Sanshu Mirin was manufactured by a traditional brewing technique explained as “brewing as much mirin from as much rice.” This technique has been alive for over 200 years in the Mikawa area, the home of mirin. Since our foundation, this mirin has been nurtured in our brewery, which has devoted entirely to mirin manufacturing. It is rich in the natural sweetness, deliciousness and flavor of rice. Unripe green plums are immersed in Mikawa Mirin to make this two-stage prepared plum liqueur “without using any sugar.” After matured for a long time, freshening plum flavor blends with the natural sweetness of mirin into rich and mellow plum liqueur. Sanshu Plum Liqueur 10 is a Japanese-style liqueur of our specialty with a long finish. It was nurtured in our brewery, which has devoted entirely to mirin manufacturing. Unripe green plums are immersed in Mikawa Mirin to make this two-stage prepared plum liqueur “without using any sugar.” Sanshu Plum Liqueur is dry with sharpness in rich taste. As it is so refreshing and pulpfree, it goes down smoothly. This plum liqueur sets off the taste of side dishes to go with sake when you drink one before or during meal. Mirin has been brewed as sweet sake. In the Tokugawa period (continued for about 260 years since 1600), mildly sweet mirin was called “Naoshizake (meaning remade sake)” or “Yanagikage (meaning sake to be drunk beneath the shadow of a willow).” In summer of those days, it was cooled down well and drunk to dispel the summer heat. Its decent sweet, profound, generous taste is fit precisely to drinking after meal or before going to bed. Sanshu “Yanagikage” was matured for a long time after preparation at an old compounding ratio. Just taste one as rice liqueur.